While the rumored iPad Pro refresh has yet to happen, Tuesday's 9.7-inch form factor update serves as an affordable enticement to older iPad users from the iPad 2 to the iPad 4 to retire out-of-date equipment —and to do it now. An oft-cited mantra of the tech press has been that the iPad 2 is the most populous model of iPad. While that has changed since 2015, the numbers still aren't all that far off from that moment in time. As recently as December of 2016, a large amount of iPad users are still using pre-iPad Air hardware. 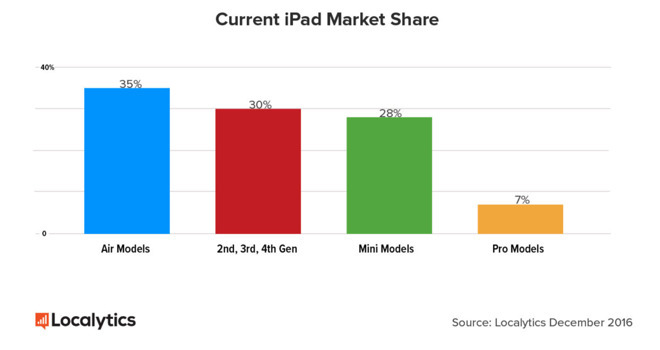 According to analytical firm Localytics, users of the iPad 2, iPad 3, and iPad 4 are a whopping 30% of the installed base. The iPad mini sits at 28%, and the iPad Pro, including the 9.7-inch model sits at only 7%. Personal reasons have probably kept most of the old gear alive. However, with the new iPad, there has never been a better time to upgrade. When it's been a while since the last purchase in a family, the new gear tends to have better specifications on the surface —and the new iPad is no exception. Those numbers don't always add up to real-world performance gains, but in this case, they do. We've come a long way from the iPad 2. RAM has doubled, and processor clock speeds have as well. Plus, advancements in GPU technologies make newer devices that much faster. We don't know about performance on the A9 processor in the new iPad yet. However, the iPhone SE with an A9 processor has a Geekbench rating of 4014. The iPad 4 has a benchmark of 1281, and the iPad 2 has a measly 570. The security reasons to buy the new iPad are clear —Apple's latest operating system is unavailable to the iPad 2 and iPad 3 owners, potentially leaving them open to some vulnerabilities discovered recently. The iPad 4 is the oldest iPad that can run iOS 10. There are no guarantees that iOS 11 will maintain iPad 4 compatibility. With more and more threats popping up, keeping users on an up-to-date platform who may not be interested in conventional computing countermeasures against threats has clear benefits. In all likelihood, the new 9.7-inch iPad will be able to get all the latest iOS updates for another five or six years. The last iPad 4 rolled off the production lines at some point in late 2013. That means that barring a battery replacement, we're looking at a three-year old battery. Batteries rely on finite chemical processes. As a result, they have generally a three-year useful life on the average. While some will last longer, none of the surviving iPad 4 population should be anywhere near maximum capacity. A new battery for an older iPad from a trustworthy vendor runs about 10% the cost of the new iPad, not even including the cost of labor or tools necessary to do it. Apple charges $100. The only reason at this point to hang on to an older iPad is because you already own the older one. The next few years won't be kind to Apple's first four iPad models, with the original iPad basically put out to pasture with iOS 5 and of little use to anybody anymore. Nobody's saying that you should toss your old iPad. Here at AppleInsider we'd be lying if we said that we didn't have an old iPad or two still kicking about performing some function or another —but none of them are connected to the internet, at all. Security is paramount. The only way to guarantee that in internet travels is to be sure that you've got an up-to-date system —and Apple's new iPad is the same form factor as the original, and at its cheapest price point yet. The iPad 2 and 3 just aren't safe anymore, and the iPad 4 isn't far behind.